‘Maddy, Jade and Sophie, in a car driving back from camp, decided that they were to do something that would make a difference and would be achievable. 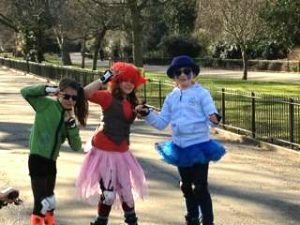 They also really like rollerblading and decided to raise money. Sophie had been to the myotubular trust concert at Christmas and was really moved by the atmosphere, and put forward the idea to raise money for the local charity. Jade and Maddy had heard of the charity and immediately agreed. The date took many weeks of planning but it was settled for the 25th of February. As the day came closer all three girls collected their own pots of money – which would all be added up at the end. On the 25th Sam (Sophie’s dad) picked the girls up, and drove them off to Battersea Park. The girls dressed up in fancy outfits and gave themselves names (Sophie: The blue, Maddy: The clown of a princess & Jade: Queen of rock.) They arrived and put their rollerblades on. It was a cold but sunny day – the girls, excited but anxious, set off to do the three laps of Battersea park!! !